Don’t let missing teeth destroy your smile or decrease your quality of life. An appealing denture or partial could restore your self-esteem and the day-to-day function of your smile. Here at the Center for Dental Anesthesia, Dr. Mady and his associates provide a wide range of beautiful denture options. In today’s world of modern dentistry, we are able to fashion traditional dentures from safe, comfortable, and durable materials. Full dentures are a complete set of upper or lower teeth that are supported by the tissues of the oral cavity. Partial dentures are several replacement teeth that are attached to the healthy teeth that still remain in the mouth. Traditional dentures are removable for the patients’ convenience, and they are the best option for those individuals who are missing a significant amount of jawbone. We also provide high-end dentures, which are composed with lifelike materials like acrylic resins that flawlessly imitate the look of natural teeth and gums. 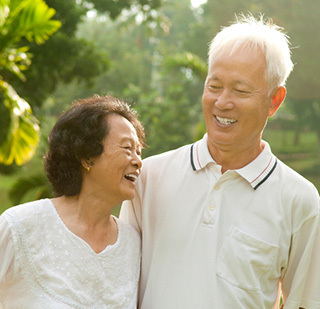 Another specialty option we provide is custom-made dentures. Your custom dentures are set in a wax base so that you can try them on before the denture is completed. Together, we will work towards creating a denture that will fit you snugly and give you a completely natural look. If you are searching for the most secure denture option possible, implant dentures may be the best choice for you. Implant dentures, or permanent dentures, are not removable like traditional dentures. Instead, permanent dentures are anchored into the mouth, just like natural teeth. If your smile is being ruined by weak, damaged, or missing teeth, come talk with Dr. Mady about your denture options. He has helped many patients with a wide range of needs achieve complete smiles without discomfort or worry. Here at the Center for Dental Anesthesia, you can Wake Up With a Smile after enjoying the calming effects of IV sedation or general anesthesia. Your denture procedure will be relaxing, and you can wake up to the smile of your dreams. Give us a call today to set up your consultation!